Your website was created with some sample pages. You should edit these pages and replace the content with your own. Login to your website using the Login link from Site Tools on the right sidebar of your website. 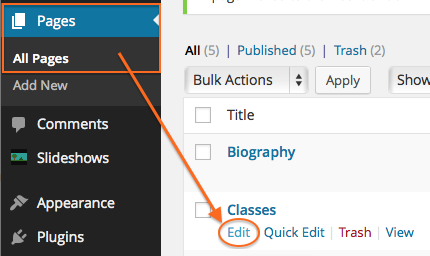 Go to the Pages > All Pages section, hover over Classes and click Edit. Alternately, if you are logged, in you can select Edit from the Public view of your Classes page. Replace the existing content with your own. We have created some sample text to help you get started. 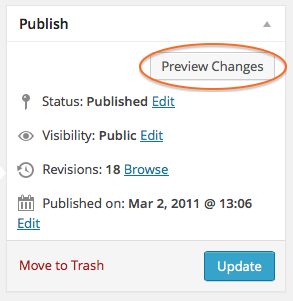 Click Preview Changes in the Publish toolbox in the upper right of the page to preview what your page will look like with your own content. The Preview page will open in a new window or tab of your browser. 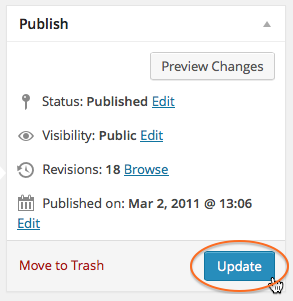 When you are satisfied with the changes, click the Update button in the Publish toolbox of Edit Page. 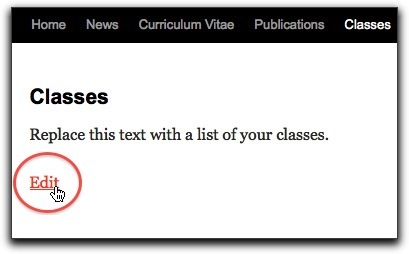 Your content will be published to your Classes Page.